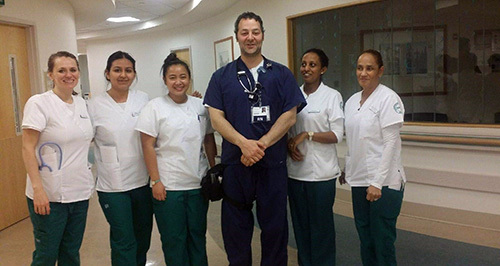 DAISY Award winner Nowman Karram poses with student nurses. Exceptional patient care in a hospital setting is not always about easing physical pain or checking vital signs. Sometimes being a relentless researcher can make all the difference for a patient. Indeed, the determined troubleshooting by Nowman Karram earned the Grand Canyon University nursing student a 2018 DAISY Award for exceptional patient care. The DAISY (an acronym for Diseases Attacking the Immune System) Award was created in 1999 as a way to honor nurses who create an environment where compassionate care thrives. Winners have represented more than 3,000 health care facilities and schools of nursing in 50 states and 18 countries. Karram won a DAISY Award for his extra effort at Sentara Northern Virginia Medical Center in Woodbridge, Va. An online student, Karram is working in Virginia while enrolled in GCU’s MSN-Ed program, which will earn him a master of science in nursing with an emphasis in nursing education. Karram was nominated for the award by a heart patient who needed to undergo a magnetic resonance imaging (MRI) test. The patient’s pacemaker complicated the procedure. “The pacemaker was of unknown origin, and we had to figure out if that pacemaker was compatible in an MRI, so I had to track down the developer, and then contact a cardiologist to see if the device was compatible with the MRI machine,’’ Karram said. The pacemaker did not have a tracking number, requiring a trial-and-error process that lasted for more than three hours. In light of Karram’s persistence, the patient wrote a note of appreciation, then nominated Karram for a DAISY Award. Karram was recognized for exceptional patient care. In the absence of Karram’s research, ensuring compatibility to prevent damage to the heart, the MRI would have been scrubbed. 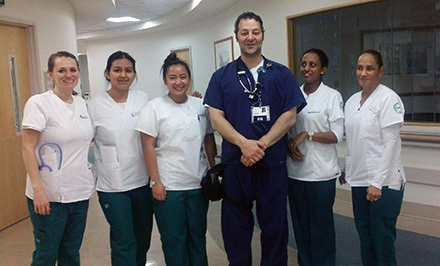 “The current must be in the correct area of the heart,’’ said Karram, who works as a resource pool nurse, floating around the hospital to fill needs during his 12-hour shifts. After earning a bachelor’s degree in science at George Mason University in Fairfax, Va., Karran entered an online master’s program only to drop it for one year to save up money to continue it. When he tried to re-enroll, his previous credit did not carry over. Dismayed, he met with a GCU recruiter who evaluated his transcript and accepted a majority of his previous credit. “Instead of wasting time and taking classes over and over again, GCU said, ‘We’ll accept these. You’ll start in this area … ,’’’ said Karram, who has been enrolled in GCU’s master’s program in nursing education for the past two years while simultaneously working at the hospital. “A lot of the information I’ve learned from GCU has enhanced my knowledge,’’ Karram said. “Many of the things I’m learning are present in reality at the hospital, like dealing with pressure ulcers. By constantly assessing skin, providing proper nutrition and applying barrier cream, Karram strives to prevent pressure ulcers, which occur when immobile patients cannot turn or move. Despite the literal distance between Karram and his GCU professors, he feels that technology has closed the gap. Taking one class at a time, Karram has 18 months remaining in his program. His goal is to move into research or nursing education, which will fill a shortfall, according to Dr. Lisa Smith, Dean of the College of Nursing and Health Care Professions. 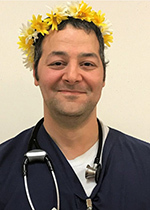 In the meantime, Karram’s tireless patient care is being celebrated as professors, classmates, co-workers and patients alike have congratulated him on his Daisy Award. “You put your time, soul and effort in trying to find ways to make people happy,’’ Karram said. Previous GCU winners of the DAISY Award include Dr. Sheri Spicer, a 2013 winner who retired from GCU last year, and a 2015 winner, Dr. Tamara Wisely, Assistant Dean of Graduate Studies. Congratulations Nowman for going above and beyond!